Hiya, my name’s Scarlett Moffatt and I love random facts. Almost as much as I love sitting on me sofa. You might know me best from my most famous and celebrated sit thus far on the I’m A Celebrity throne. You might also know me from all sorts of other seats, most especially my Gogglebox sofa. Well this book is my attempt at telling me life story through a whole series of them! So I’d like you right now to stop what you’re doing and take a seat, whether it be in the comfort of your own home, on the top deck of the bus, on the tube (so you don’t have to make eye contact with anybody) or on the throne of the house (a.k.a. the toilet). I want you to get comfortable and get ready to laugh, cry and maybe even learn a bit, as I chat to you about some of the highs and lows of me life. Published by Blink Publishing Oct 19th, click HERE to pre-order your copy! SCARLETT MOFFATT is a beloved television personality and presenter from County Durham, best known for appearing in the Channel 4 series Gogglebox, and as the winner of 2016’s I’m a Celebrity… Get Me Out of Here! She is now a presenter on Ant and Dec’s Saturday Night Takeaway, as well as the brand-new face of Streetmate. Scarlett is also the Sunday Times No. 1 bestselling author of Scarlett Says, and has a top-selling fitness DVD, Scarlett’s Superslim Me Plan. 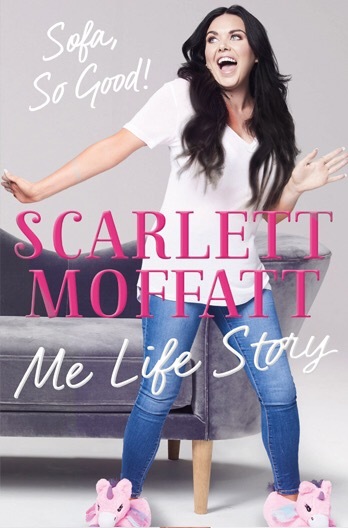 I’ve always been a fan of Scarlett’s so I was delighted to be able to read Me Life Story pre-publication. It’s safe to say I’m an even bigger fan now! 😍 This book is hilarious, honest and just so fun to read. I read the whole thing over the course of a day because I genuinely couldn’t put it down. Scarlett has a thirst for knowledge, which I can totally appreciate because I’m the exact same way. 🙌🏼 Each chapter is begun with some facts, which I loved, because it gives an insight into the kind of random things that she’s interested in. Plus, she worships at the altar of Proffessor Stephen Hawking! Can’t get much more intelligent than that! As well as some genuine laugh out loud moments the book is interspersed with some of the harder times in Scarlett’s life so far. I can empathise with some of it as I’ve gone through it too, and her honesty is really refreshing. Plus her Northern-ness is almost like us Irish, a sense of humour can really help you through some dark times. I honestly loved this book. It felt like a chat with your best mate, like the ones you’d have late at night talking about everything and anything! A real honest and genuinely funny book, it was definitely a brilliant read!